Most of the Declaration of Independence was Thomas Jefferson’s work, however, and he apparently was miserable when other members of the Continental Congress debated the draft and cut at least one-fourth of his original work and amended many other passages. According to David McCullough in his book, John Adams, Franklin was seated beside Jefferson during the debates and consoled him with the following story. He “had once known a hatter who wished to have a sign made saying, John Thompson, Hatter, Makes and Sells Hats for Ready Money, this to be accompanied by a picture of a hat. But the man had chosen to ask the opinion of friends, with the result that one word after another was removed as superfluous and redundant, until at last the sign was reduced to Thompson’s name and the picture of a hat.” I doubt that it made Jefferson feel any better. Mike, thanks for sharing these Maira Kolman pieces. They are so inspirational! 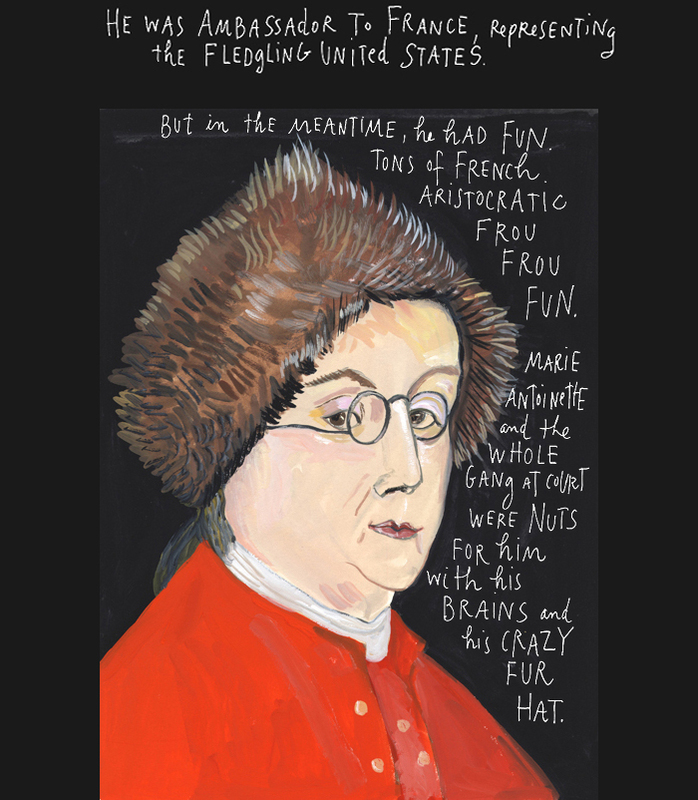 Maira Kalman reminds me through her art and her subjects that anything is possible. H. W. Brands. The First American: The Life and Times of Benjamin Franklin (2000) full-length biography. However, as much as we rightly praise Franklin for his wide range of accomplishments, discoveries and “good works,” he fully participated in political satire, using pen names to mask (with various degrees of success) his attacks on politicians. So amid many other titles we can give him, a couple important ones are satirist and political fighter.